In front of a full aldermanic chamber at City Hall, Harp painted a picture of a city resistant to Trump’s vision for America, resistant to Connecticut’s cities-vs.-suburbs mentality, and resistant to any notion that New Haven isn’t a city on the rise. She borrowed a word — “resistance” — that has become a phrase for local movements across the country formed to oppose the current administration in Washington. 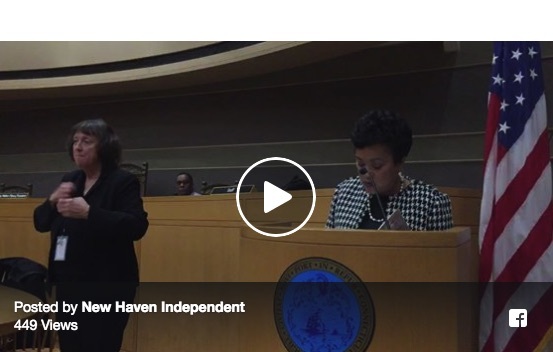 Harp said that New Haven continues to offer a hand to its residents even though there is “a trend in some government circles to neglect or abandon the aged, the vulnerable, and those who simply can’t keep up. “In New Haven, elected officials, city workers, residents, volunteers, students, immigrants, and a host of other city partners make this a vibrant, attractive city, committed to its better days ahead. New Haven is resistant – and will continue to resist – a laundry list of frightful trends in America,” she said. “Perhaps most frightening among them is a deliberate attempt by some in this nation to deny benefits of the American dream—safety, security, education, healthcare, opportunity — to any number of Americans for completely arbitrary and unjustifiable reasons. Harp said New Haven has “resisted” by rallying to the side of displaced Puerto Ricans with ongoing aid and relocation assistance; by partnering with Bridgeport in a long shot but, alas, failed bid for Amazon’s second North American headquarters; and by creating a favorable climate for development that is starting to pay dividends downtown and beyond. She also noted that since she took office New Haven’s unemployment rate has dropped from 10.3 percent to 5.1 percent. “As I complete my assessment of New Haven this year, and as I assess the state of other cities nearby and frankly, across the nation, there isn’t a city I envy, there isn’t a city I’d rather serve as mayor, and there isn’t a community of people I’d rather be with as we tackle a daunting agenda under these current, challenging circumstances,” she concluded. Several alders were getting their first taste of the mayor’s “state of the city” address as a member of the Board of Alders, and they found a lot to like. Yale Alder Hacibey Catabasoglu said he was happy to hear about the city’s infrastructure and the improvements that have been made, such as the wifi on the Green and efforts to help small businesses. He applauded the city’s efforts to bring in companies like Goldman Sachs to teach small immigrant business owners like his father. He added that he would have liked for Harp to talk a little bit about youth activism in the city and how their political activism helps New Haven resist. First-term Newhallville/Prospect Hill Alder Kim Edwards said she found the mayor’s message about the state of the city to be positive and upbeat. Edwards said while she knows there is much work ahead on the budget, she said she was impressed that the city has managed to cut its unemployment rate nearly in half. But like Edwards, Roth noted that the upcoming tango with the budget is on the horizon. And Harp didn’t have a lot to say about that in her address aside from mentioning the reduction of overtime in the fire department. There will be time for focusing on that soon enough for Morris Cove Alder Sal DeCola, but Monday night the mayor’s speech had him focused on the positive. Fair Haven Ernie Santiago saw some flowers when he heard Harp say that a sweep that helped the city assess the needs of Newhallville last year will make its way to his community. Freshman Newhallville/Prospect Hill Alder Steve Winter said he appreciated the message of resistance and believed it was needed. He also noted that he’s interested in hearing more about how the digitization of city services and other technology could help the city maintain a high level of service in a tough fiscal environment. “With values and institutions under assault, it’s important to have our leaders and our colleagues remind us of why we have to do what we do and why you have to keep going,” he said.